Yesterday I mentioned the faint glow near the horizon as due to airglow of the atmosphere. It tends to be a very faint effect, even more dim than the zodiacal light, and isn’t often seen with the naked eye. 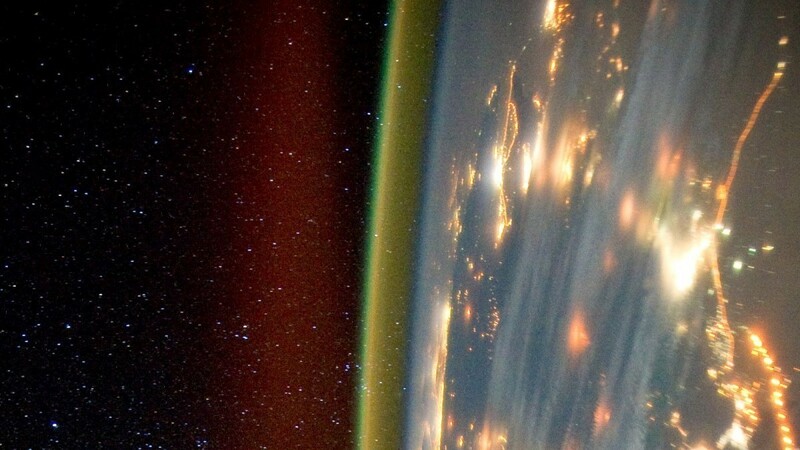 While airglow is beautiful in images, for ground-based astronomers it can be bothersome. Airglow occurs when atoms and molecules in the upper atmosphere are ionized, either by light from the Sun, or by cosmic rays. There are also chemical reactions that produce light in the atmosphere. All of these effects combine to give the atmosphere a faint but uniform glow day and night. It’s only at night that the effect becomes visible. 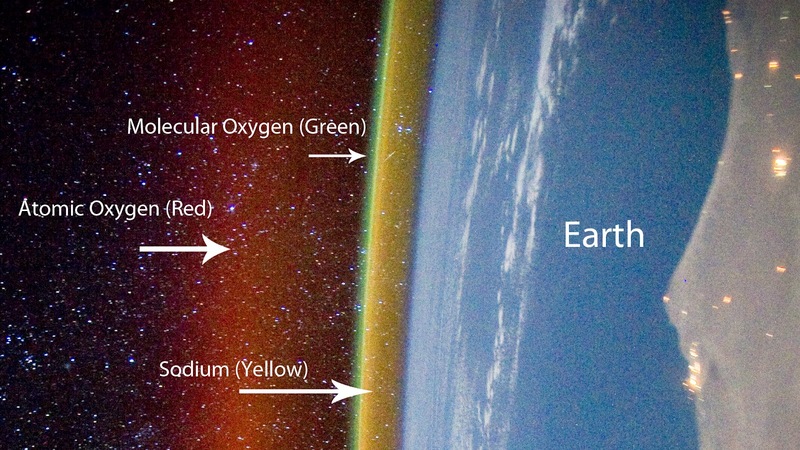 While the green glow of molecular oxygen tends to be the dominant color, you can also get yellow from sodium, red from atomic oxygen and even a weak blue glow. Because airglow is spread throughout the sky, it tends to hamper ground-based astronomy. Basically it is a kind of light pollution that never goes away, no matter how isolated your observatory is. One way to overcome the effect of airglow is to limit your telescope’s field of view. If you observe a faint object in a small portion of the sky, the patch of air above your view is likewise small, and the airglow effect is less significant. There are also ways adaptive optics can limit the impact. But as we build ever larger ground-based telescopes to look at ever dimmer objects, airglow could increasingly become a problem. It’s a recurring problem in astronomy, where what’s right in front of you isn’t what you want to observe.